I was interested in seeing Horatio’s Drive, a Ken Burns documentary on PBS, when it came out, but my TV viewing time being extremely limited, I simply didn’t get around to it until last week. Which means this will be old news to some of you. But not to all. The early automobile was viewed as a rich man’s toy. Many thought it was a passing fad. There were enthusiasts, however, who saw the motor car as the future of transportation. Horatio Nelson Jackson was one of them. In 1903, Dr. Jackson bet some other gentlemen $50 that he could drive from San Francisco to New York City in less than 90 days. This was plain crazy, and I’ll tell you why. He barely knew how to drive and he’d never owned a car. The one thing you could rely on early autos for was breaking down. Even going short distances, tires blew out, engines blew up, and parts fell off or broke. Constantly. And this happened on smooth roads—which existed only in metropolitan areas. Dr. Jackson was proposing to drive across the country—where, in many places, the roads barely accommodated a horse and wagon--and where rivers and streams didn't always have bridges spanning them. There were no auto parts stores or gas stations. Broken parts had to be repaired by one’s trusty mechanic, or rebuilt by the local blacksmith (ah, irony) or ordered from the factory and sent on by train. Dr. Jackson bought a somewhat used Winton Touring Car and hired a mechanic to go with him. Everything that could go wrong did, yet Jackson persevered. The PBS site offers the story summary as well as a map and pictures. You can also find a story summary on Wikipedia. The actual car, and other artifacts, are at the Smithsonian, along with info about the trip. But the film is well worth watching, for a sense of the man's vibrant, optimistic personality, as so wonderfully voiced in his letters to his wife. 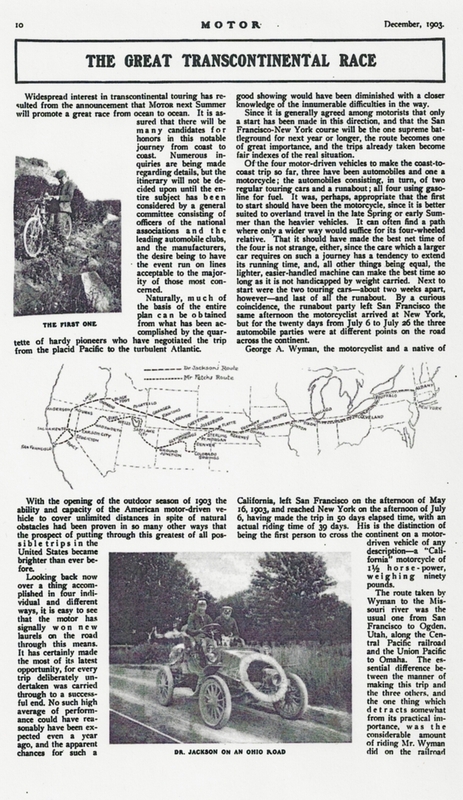 Dr. Jackson brought along a camera, and his photos capture the world he, his driving partner Sewall Crocker, and the bulldog Bud traveled through . . . a world their journey changed irrevocably. 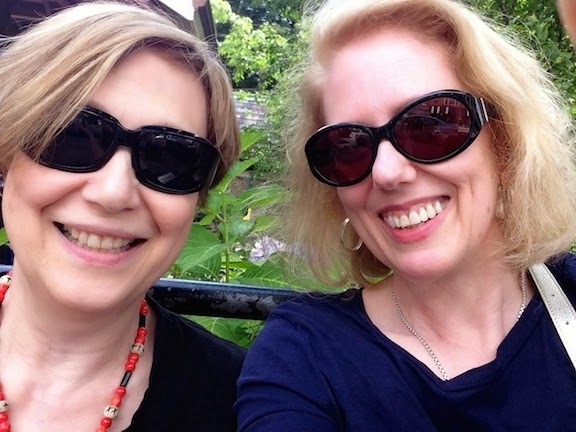 I knew a woman who lived "far" outside Houston on the west side of town - about 30 miles. She and her siblings drove their Dad's Model T to school in Houston every day and had to contend with flat tires and breakdowns almost every trip. Today, depending on traffic, you can make that same journey in about 20 minutes. My older friend died four years ago at 100 years of age on Christmas Day, but I did learn a lot about Houston's early history from her. 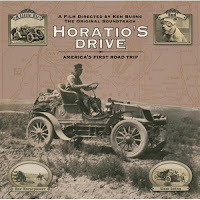 There is also a book that accompanies this documentary: "Horatio's Drive" by David Duncan and Ken Burns (Knopf 2003)that has many illustrations and texts of his many letters to his wife during the trip. Fabulous stuff - we take our driving across country so for granted - kudos to this gentleman (and to his friend Sewall Crocker and his bulldog Bud!) 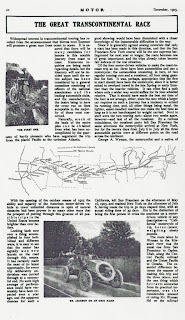 who braved the roadless country in 1903! Thank you, Loretta! I don't keep up with PBS right now since our local public station is no longer an affiliate but I'll look online for a way to find this. Sounds like another winner for Ken Burns. I'll look for that show. Made me think of the John Wayne film 'Big Jake' where they started following the bad guys in motorcars, but of course just ended up on horses. I've been loving your blog for weeks and now you've given me PBS! I am an American living in England and although I do benefit from the BBC, it has largely gone commercial in its programming which means a lot of garbage. I never appreciated PBS properly when I lived in the US, but I can see us having some great times with it now! And for once, I'll be willing to donate! Educational TV is so important and so enriching. I love the book. When it came out, I had a black version of Bud (my intrepid Staffie, Dorothy Parker), and had to have it as soon as I saw Bud’s smiling face.